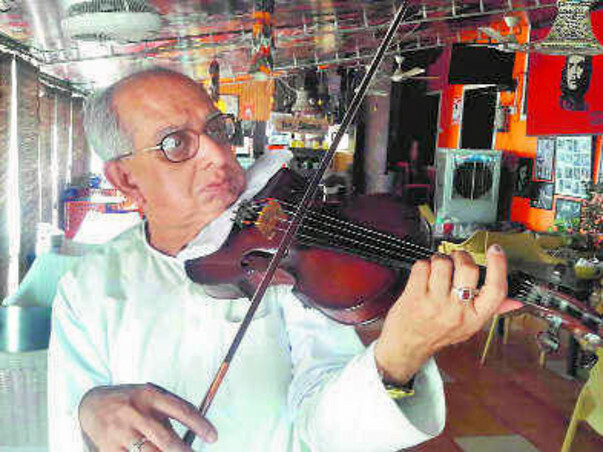 Swapan Sett, a 71-year-old violinist from Kolkata, is on a mission to raise money for his ailing wife, a cancer patient. She is under treatment at the Tata Memorial Hospital in Mumbai. Sett travels across the country, plays violin at public places and collects money to achieve his target. At the same time, he promotes classical music among youngsters. He performs at restaurants, hotels and other places. 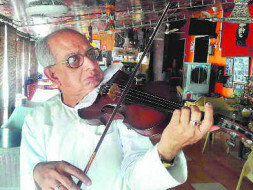 He has been able to generate money by selling CDs containing 24 tracks of melodious violin recital. I talked to him and find him true artist at heart. He believes in sending CD's and his paintings to his cause supporters. He is a simple man and has no email or social media presence. You can send check or letters and he would be happy to reciprocate in whatever way he can. For authenticity look at the end of this note. To get in touch with me, click on the 'contact organizer' button below the campaign page. Poornima is currently doing okay. Her treatment is still going on. She is on medication and the doctors have advised her to come for follow-ups regularly and she is responding well to the medication. We are all hopeful and praying for her recovery. Please keep praying for her. Thank you everyone, once again! I am Ankita from Milaap. I had a talk with Mr. Swapan Sett today regarding his wife, Poornima's health. He has shared his gratitude to all of you. Hospital but now she is shifted to Tata Memorial Hospital, Mumbai. when asked how does he manage so many things at once. The good news is she is recovering fast except for the regular medical checkups. Thanks for contributing to the cause of Swapen Sett! Good news is that we met our goal and we are getting more contributions coming in. This will really help him. I am trying to get a copy of music CD from Swapen Sett. Once I get it, will upload online and share a link with you for a download. Swapen told me he will be happy to send physical copy of CD to your address. If you like, please send me your address, I will pass it to Swapen Sett Or you can send your details on his address mentioned below. I am in the process of transferring money to his account. Will update you once all transactions are done. Thanks again for your exhilarating response and help!